Ishmael signed a reserve/future contract with the Colts on Sunday. Analysis: Ishmael went undrafted out of Syracuse last year after snagging 105 passes for 1,347 yards during his final season with the Orange. He spent time on the Colts' practice squad during the 2018 campaign and will now stick around in Indianapolis for at least another offseason with hopes of carving out a depth role behind T.Y. Hilton and others in advance of 2019. 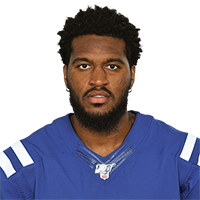 Ishmael was signed to the Colts' practice squad Tuesday, George Bremer of The Anderson Herald Bulletin reports. Analysis: It's been a busy week for Ishmael after he was cut by the Colts on Nov. 9, and subsequently brought back by the team Tuesday. The Syracuse product is unlikely to provide any fantasy value in 2018. Ishmael was waived by the Colts on Friday. Analysis: Ishmael was originally promoted from the practice squad Oct. 26. In a corresponding move, the Colts activated defensive lineman Tyquan Lewis from injured reserve and linebacker Skai Moore from the practice squad. There are no videos available for Steve Ishmael. Click here to view all videos.